The short answer is no. Not even close. The long answer is to be found below. If you haven’t a clue what I’m talking about you really need to click here. The fruit of Geiger and Gallitzendörfer’s (what a great name!) travails was the R 107. It became available to purchase in 1972 and remained so for a whopping 17 years. Apart from the G-Wagen no other Merc has come even close in terms of length of it’s production run. No other SL comes close in units sold either. You could add the complete production run of the first, second and fourth generation of SLs and still not reach the 300k+ R107s built. (I suppose if you sell it for long enough you’re bound to sell more of them). I am sorry to report that this is where the wheels really started to come off. I could be precise and analytical by complaining about it’s weight gain, it was now almost 1700kg in it’s lightest form – chunky in anyone’s language. How about it’s narrow track? Surely the antithesis of a car with sporty pretensions? There are more severe cases of automotive muffin top (which really accentuated the weight gain) out there but that certainly doesn’t let Geiger off the hook. It also spawned the only fixed hard top SL we’ve ever had – the C107 SLC. You would think this car was right up my street, a 2 door coupe with a long bonnet cloaking either a straight 6 or a thirsty V8. However this car with it’s “accordian” C-Pillar despite meeting all my usual criteria for a very desirable jammer just leaves me cold. It just looks the overweight car that it was. The introduction of a V8 is a tacit admission that the car was too heavy. Surely a straight 6 (which was still available on cheaper models) was (and remains) the perfect configuration for a light sporty car? In fairness it was already on a sticky wicket with the two little soupçons of paradise that preceded it. You couldn’t blame them either for the fact it was the wheels of choice for the ultra smug Jonathon Hart but you can blame them for designing the kind of car that he would like to drive. Maybe this brief was a poisoned chalice or maybe it was meant to be a boulevard cruiser, either way, for me, it was a real disappointment. 1989 brought us the R127. Reputedly Bruno Sacco’s favourite. It’s certainly not my favourite Sacco but without doubt it is the only blip in the otherwise exclusively downward trajectory of the Sport Leicht series. It was of course an improvement after almost two painful decades of muffin top. Despite gaining 100kg on it’s antecedent it had a lovely look and feel of lightness which helps wash away a lot of it’s sins. Sacco’s by now trademark rectangular headlamps were smaller and slanted in an oh so ’90s way and the subtly understated “fish gills” just aft of the front door were a lovely modern take on a classic Mercedes trope. It’s wedge design (for me) didn’t score highly in the “Vertical Affinity” stakes as it completely dated the R107. (Mind you archeologists had begun taking an interest in early R107s). It’s clean lines (especially with the roof down) continue to look good if a little bland. 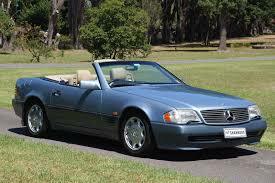 With 13 years under it’s belt Sindelfingen put it out to pasture and in 2002 gave us the R230. Sacco was now in an exclusive club of two who had designed two SLs. Could he go one better than his mentor and predecessor two full generations before and sign off with a beautiful swan song? They say all political careers are doomed to end in failure. Is it also true of the great car designers? This is one of the last cars Sacco had a hand in and I don’t think I’m alone in thinking most of this great man’s work was done pre 1990. Gone were the square headlamps. With it’s fancy pants metal folding roof helping the car reach an almost obese 2000kg (heavier than an S-Class!) in it’s lightest iteration gone was any pretence of lightness. Gone was a straight 6 (although V6’s had already been fitted to some R129s). Gone were the clean lines of it’s predecessor and any hint of that gossamer delicacy (supposedly synonymous with this series of car) was to be found at the bottom of the Schwippe. The most expensive versions now needed 12 cylinders to smoothly and quickly propel this tub of lard. It was big, it was brash and to my eyes really didn’t exude any level of class. An SL for the noughties. Not for me though. The R231 surfaced three or four years ago and is very much an evolution of what went before. Sporting the by now familiar new face of MB it has in fairness gone on a diet. When equipped with a V6 up front it has shed over 300kg on the R230 and that should be applauded. If that impressive weight loss could be matched with a similar lightness of look (I’m less hopeful on this front) and the new straight 6 that is rumoured to be coming very soon things could really get interesting. Perhaps that scraping noise is the bottom of the barrel and maybe, just maybe I’m right to harbour some cautious optimism? That was a zesty read. Nicely styled, Mick. Thanks Richard, I enjoyed writing it. It had been bubbling away in the background for a little while. Adding to that, none of the recent SLs do anything for me. I barely notice their existence. Of course, that´s partly down to living in an SL desert. The Danes don´t buy these cars. Also, it´s due to them not being written about. There is a mass of cars that aren´t written about now. However, I would have thought MB´s supposedly most prestigious cars would stand out more. That leads to me to think that cars aren´t as significant as they were. There are loads more of them and a lot more variety (in a way). The result is that few stand out the way some did a quarter of a century ago. You really don´t want to hear what cars I notice as standing out from the crowd. It´s seldom Mercedes (actually never). I really don´t bother to to look too hard at them. I did notice yesterday a new E and a new B class saloon parked close by each other. Similar, I thought. And then that´s all that I thought. They didn´t command my attention at all. 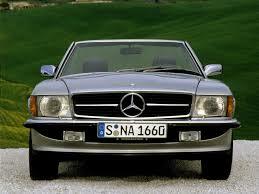 I agree, these cars should be the kind of car that makes you want to purchase a brand new MB. I have no desire to own any of the newer SLs (or any new MB for that matter) but I wish that I did want one. I don’t think that I’m being nostalgic as there are lots of new cars I do like, it’s just such a pity that the SL isn’t one. Certainly I’m more than happy to hear what new cars you feel stand out(I’m guessing the Astra might be in there somewhere!). The new Astra has not delighted me. A loaded Insingnia would be good.